Rae and Jason Miller have been RVing full-time since July 2017. They travel with their dog, Carmen in a 42′ fifth-wheel and share their adventures across social media. They’ve also unintentionally become the faces of “beginner RV mistakes” on YouTube by showcasing the many errors they made on the road. 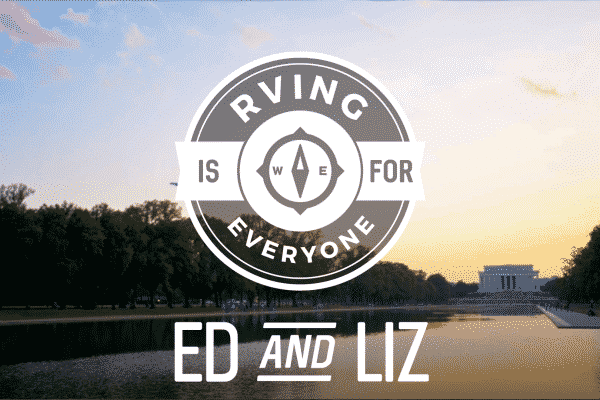 They’re transparent with their mistakes because they want to help future RVers avoid similar headaches and show the not-so-glamorous side of RV life. They just released over 70 pages worth of downloadable checklists and worksheets to help others along their journey as well! 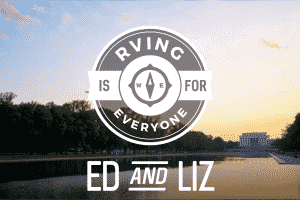 Check out all of their awesome RV printables here. You can follow their adventures (and mistakes) on their blog and YouTube channel. 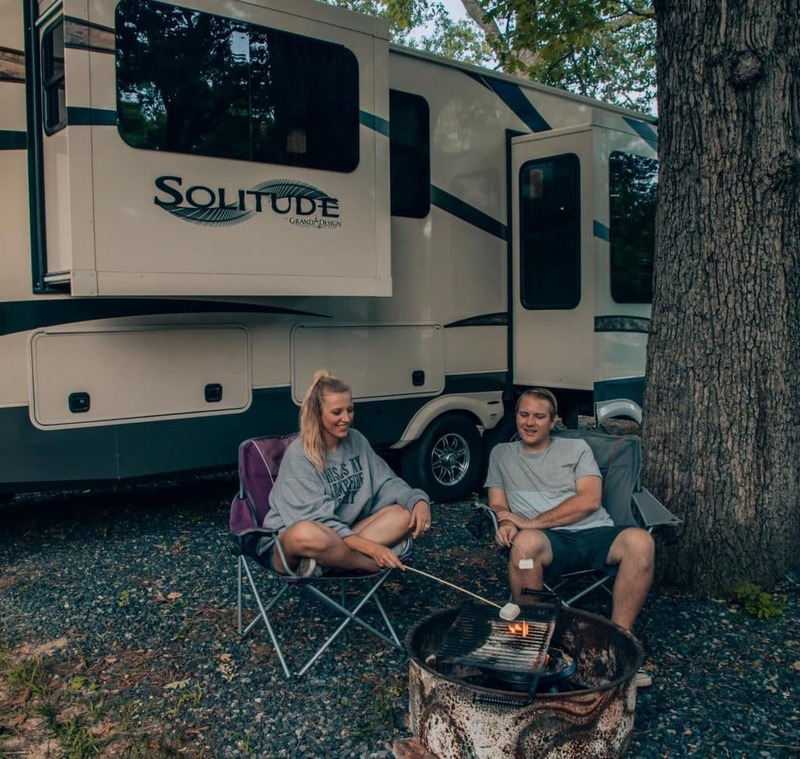 Their expertise in “beginner RV mistakes” began with a video that Jason and Rae posted after their first two weeks on the road. The video documented all of their beginner mishaps, including almost taking their RV into downtown San Francisco and forgetting to chock the wheels on their fifth wheel trailer. The response was viral, so they posted another video about beginner RV mistakes, with a focus on more humor and fewer traumatizing experiences. They have been making videos ever since! Always always always use a checklist! Make sure you are physically checking things off a list, not just making mental notes as you go along. It’s easy to get in a routine and make mistakes while packing the RV and setting up camp. Have a plan for your route. This is especially true if you have a larger RV. You can easily get stuck on small roads. Don’t overthink it. Mistakes are going to happen. You can’t plan for everything. Prepare for what you can and figure out the rest. 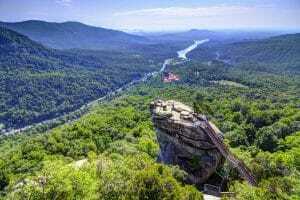 Don’t let the fear of the unknown keep you from enjoying RVing. The unexpected can lead to the best stories. 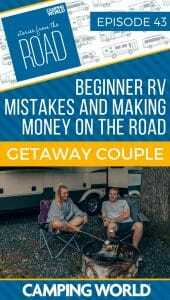 Learn more about beginner RV mistakes on the Getaway Couple YouTube channel here. Jason and Rae make income on the road through several different methods, such as YouTube ad revenue, RV checklist printables, sponsorships, and Amazon affiliate links. You can see a list of income reports on their blog here. The key is to start now. It takes time to grow revenue streams, especially with blogging, ad revenue, and affiliate income. Then, focus on ways that you can provide value for your audience. Diversify your income whenever you can. Always be on the look out of new revenue streams that also give you the opportunity to serve your audience. Don’t wait until you have reached a certain level or have learned how to do something perfectly before you get started. Just get started and you’ll figure it out along the way.